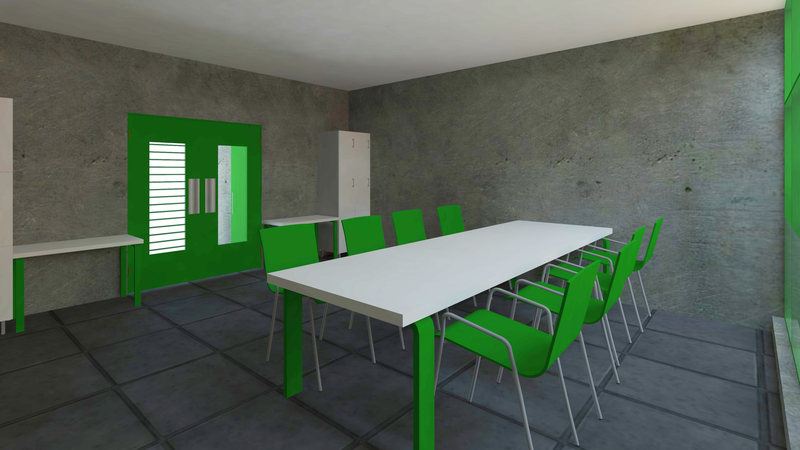 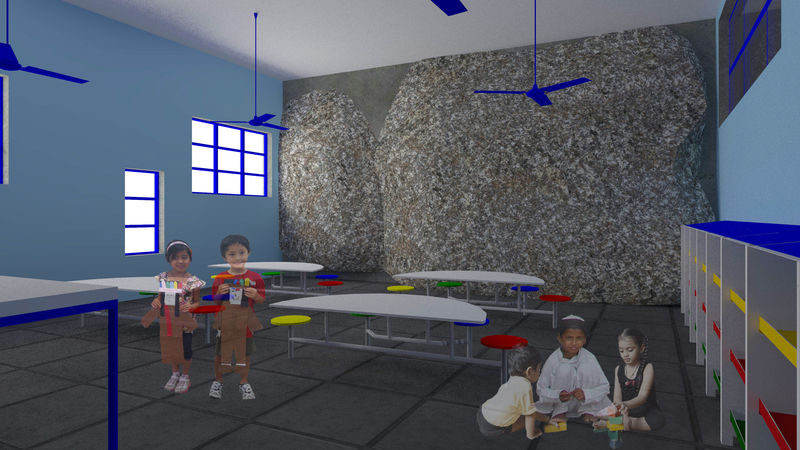 A charity school that had been run by a zakah-funded, not-for-profit educational trust for the last six years finally required a building. 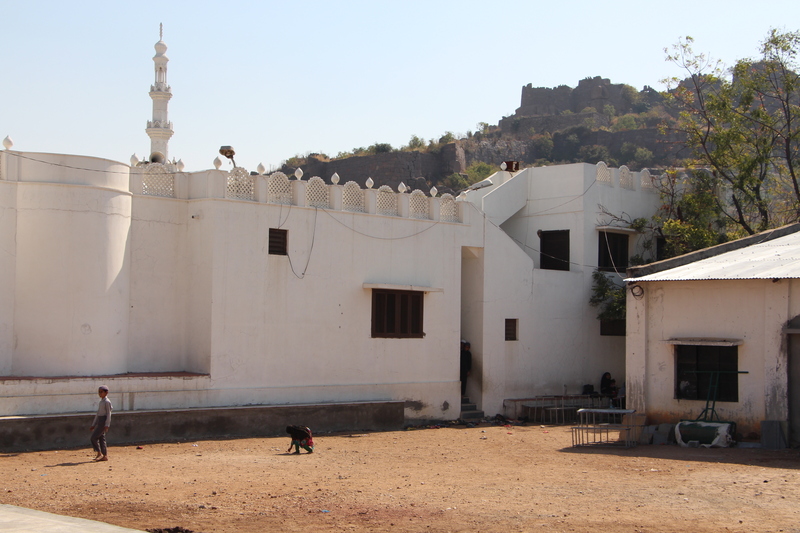 The site is located on a hill top, in the unplanned settlement within the walls of the majestic Golconda fort in Hyderabad. 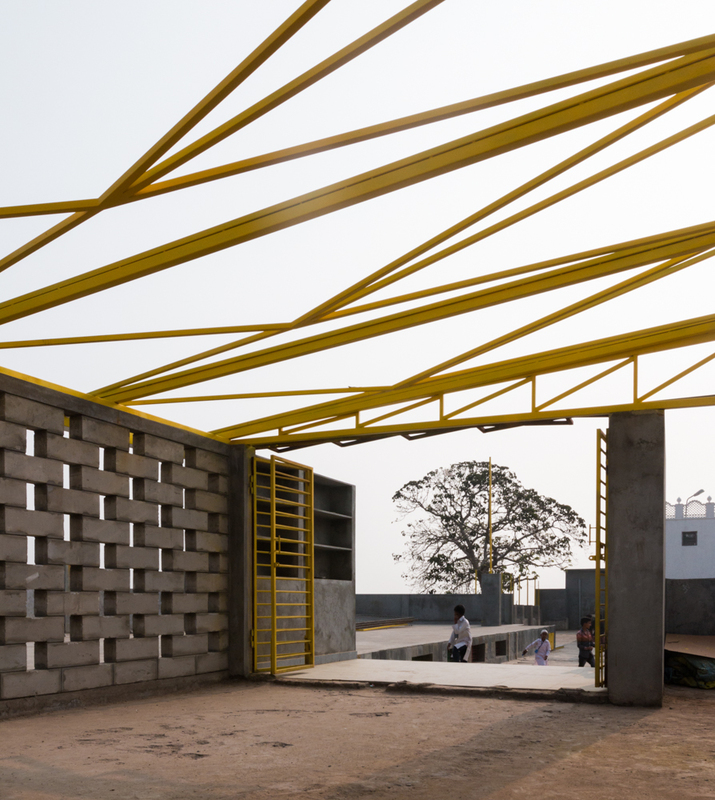 This school had been functioning out of a large shed with partitions to create classrooms. 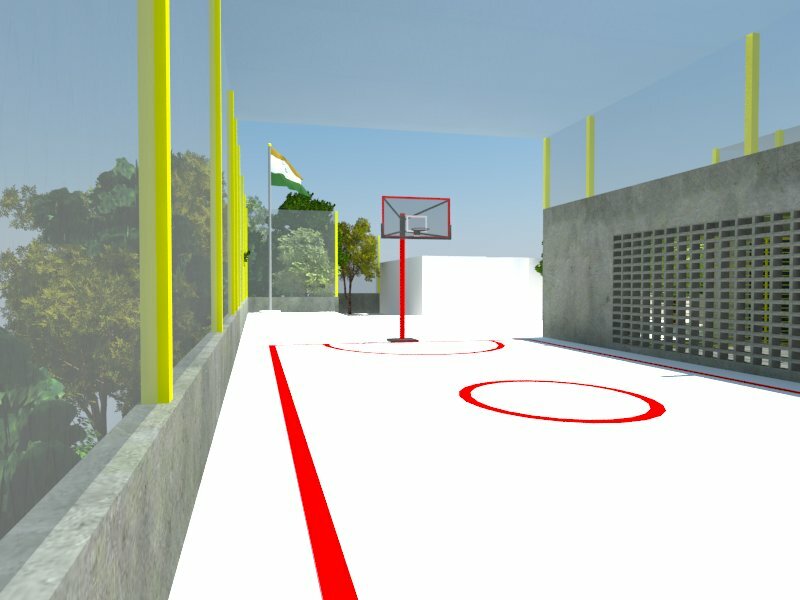 The project was riddled with multiple challenges. 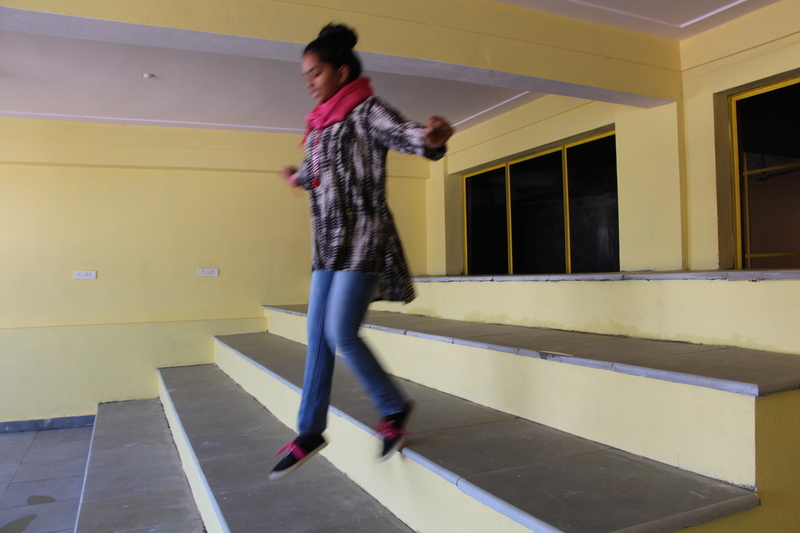 Since the school is run solely based on individual donations, the budget was extremely tight. 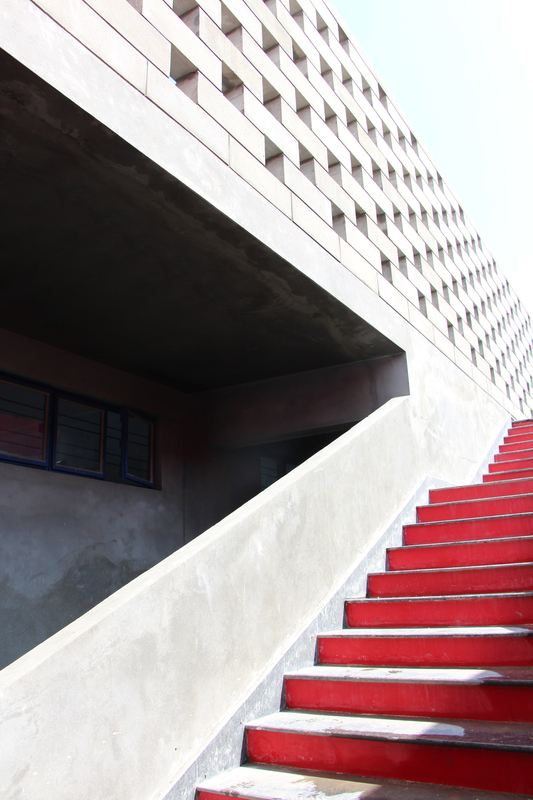 Material choices had to be economical as well as durable. 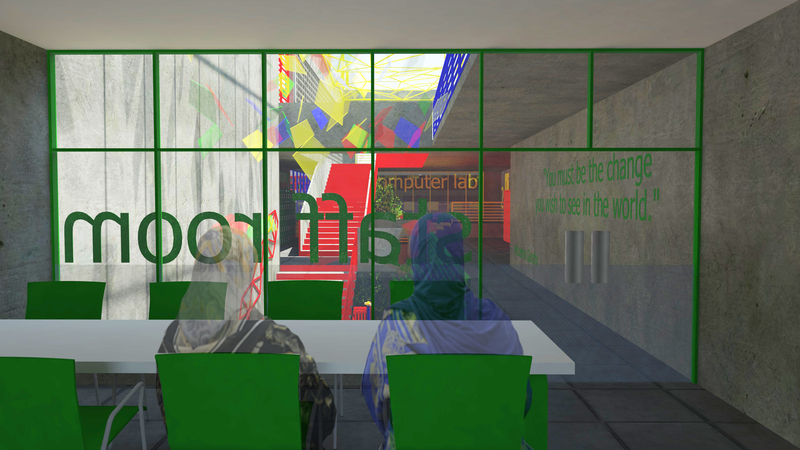 The ensemble team working on the project was mostly devoting time on a pro bono or non-profit basis. 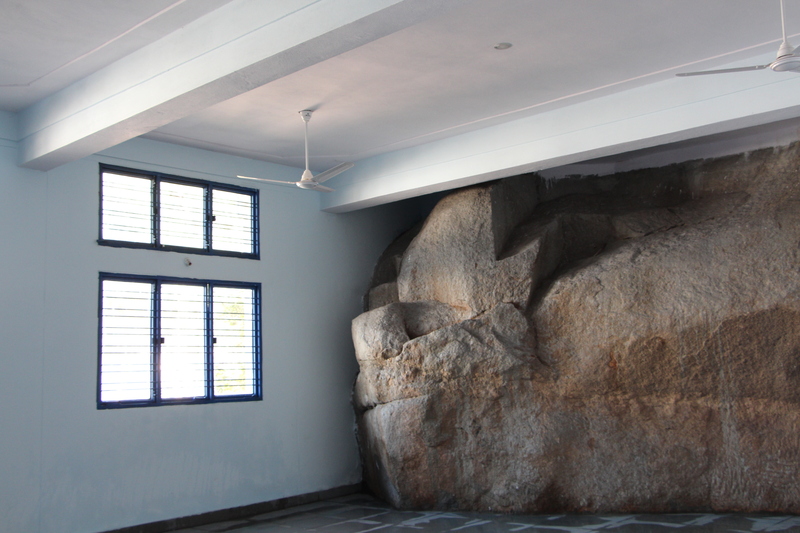 The site is highly contoured and covered with sheet rock and boulders that are 250 million + years old (a topographic trait of the Deccan Plateau) buried under a blanket of garbage piled on over decades. 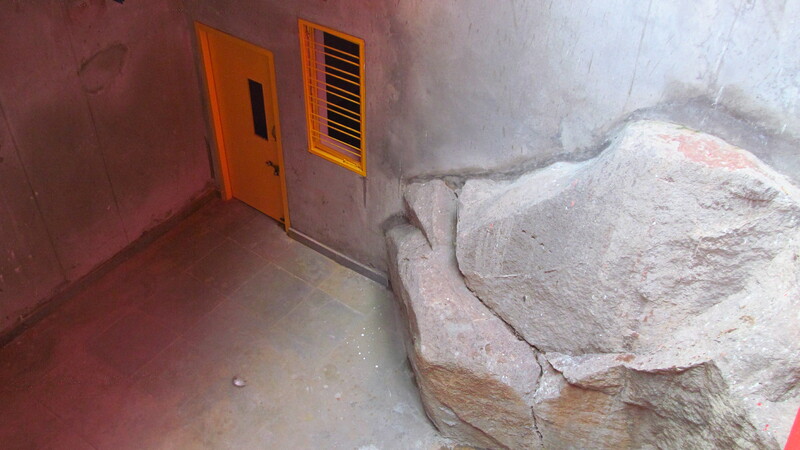 Articulating the peculiar and difficult topography of the site and its surrounds posed a major challenge: due to proximity to heritage structures and dense urban context, most of which is residential, blasting the rock was not an option, and preserving the rock was one of the project aims. 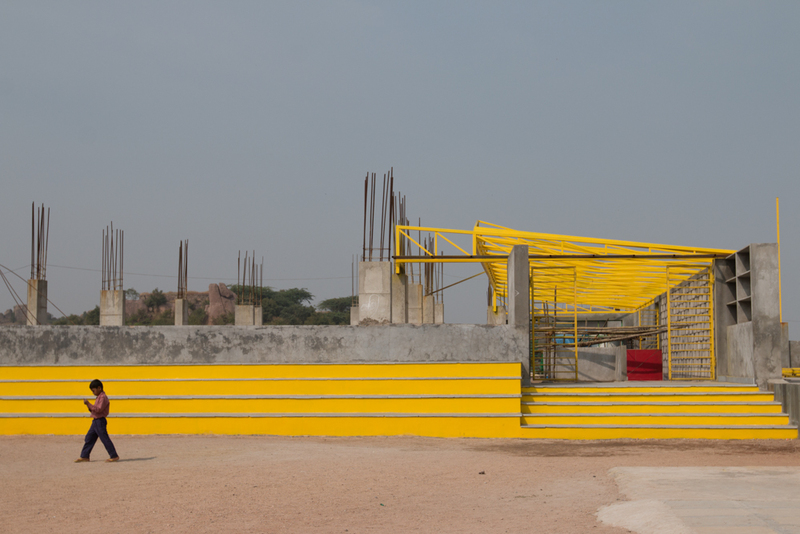 There is also a height restriction in the Heritage Zone. 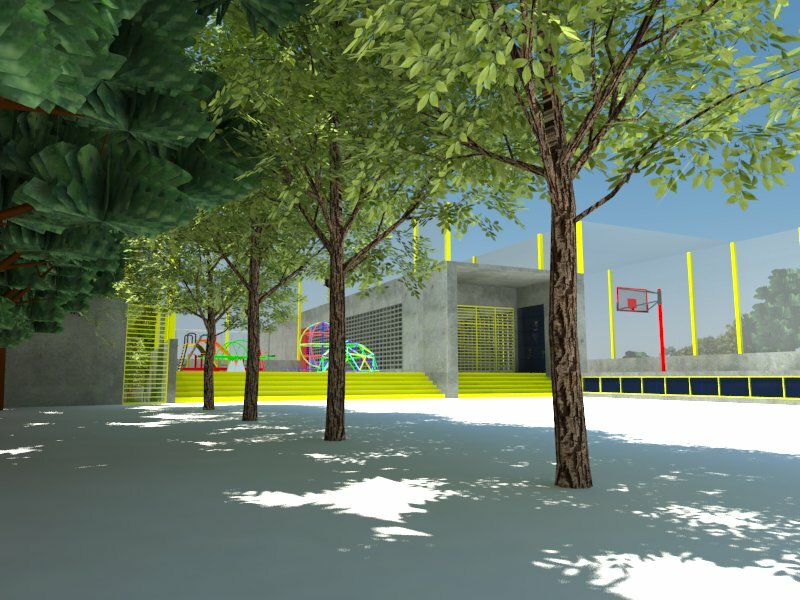 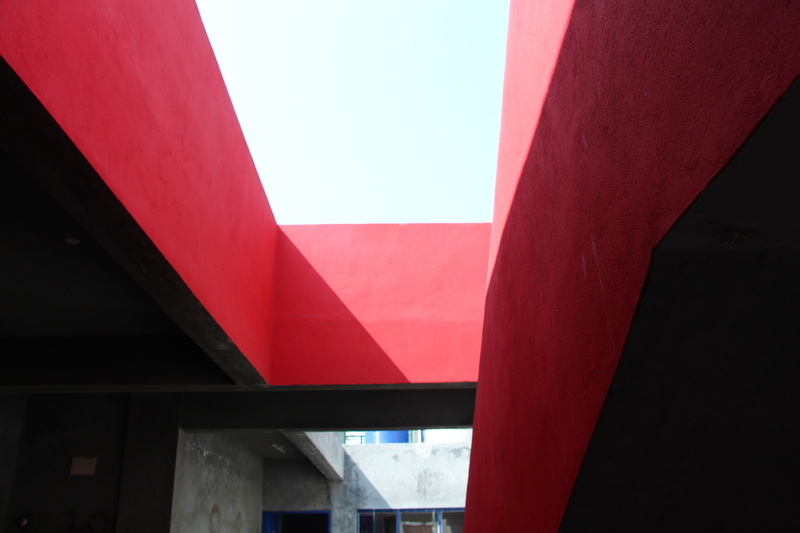 The site, apart from being a challenge, is also the beauty of the project. 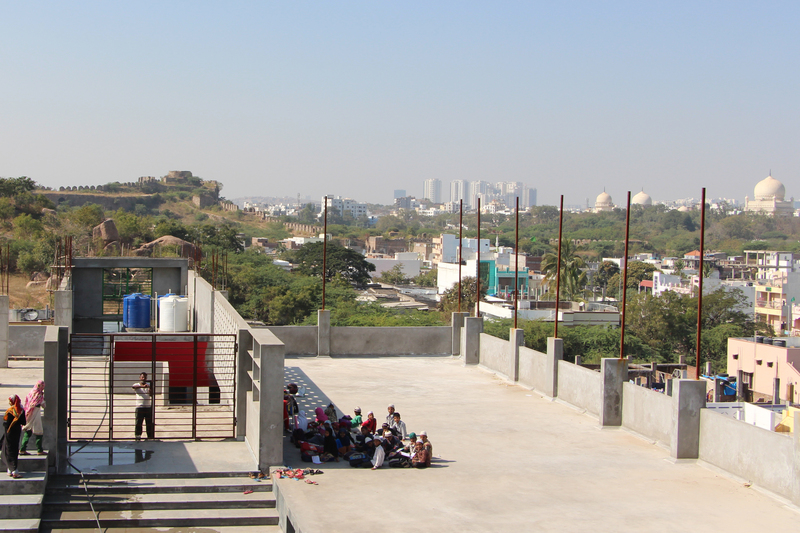 From its topmost level, the entire city is visible: the Golconda, the Qutb Shahi Tombs, the skyscrapers of Lanco Hills and the unchecked low-rise, high-density houses beneath. 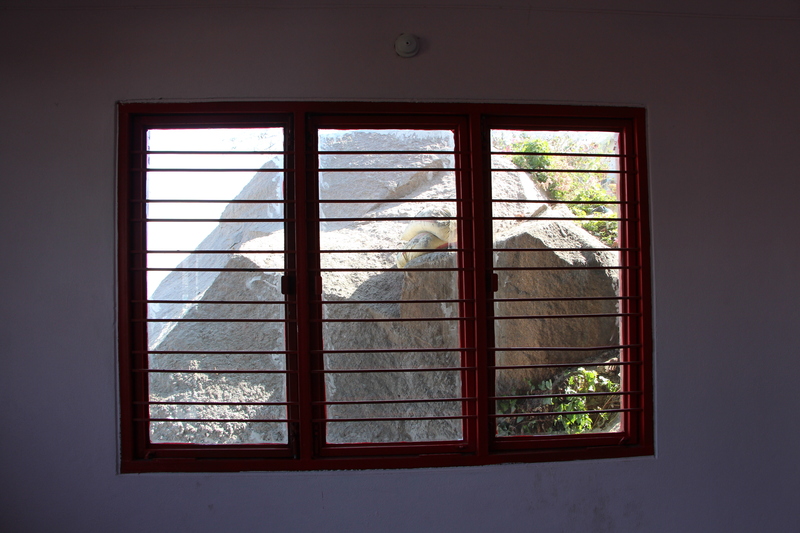 The school is situated in such a way that it engulfs the rocks within it. 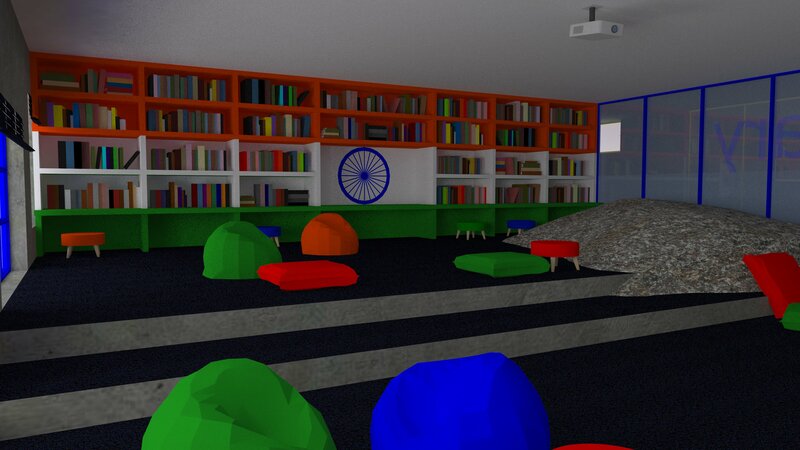 Rocks were taken into the building, forming the walls of some classrooms, and the undulating floor of the library, which becomes an informal space. 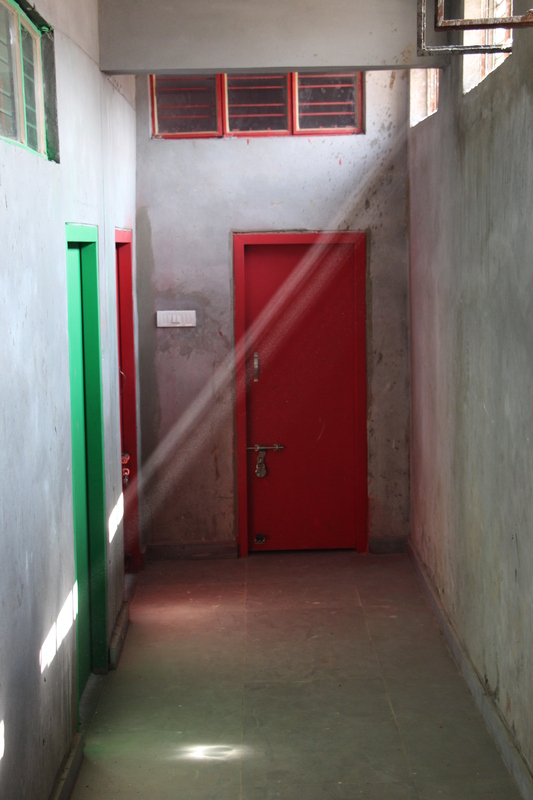 Due to shared walls with surrounding courtyard houses, a need arose to light the building from the top. 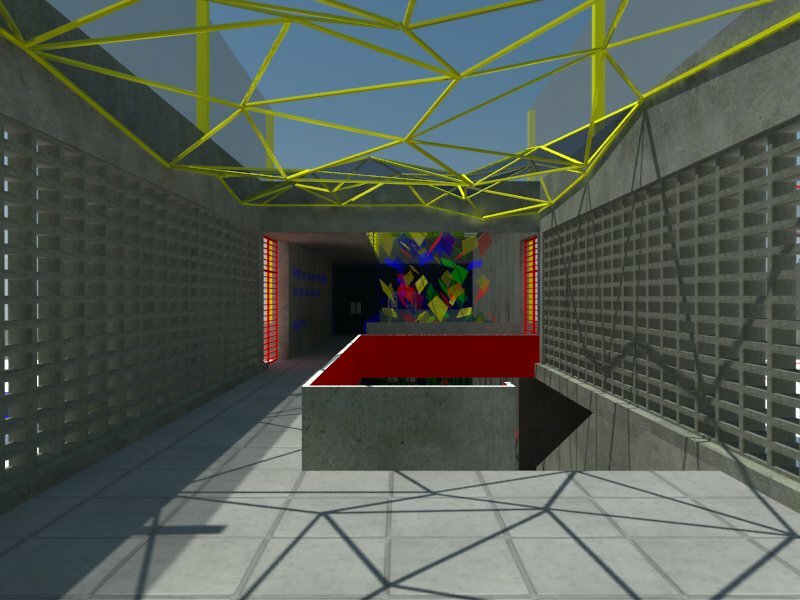 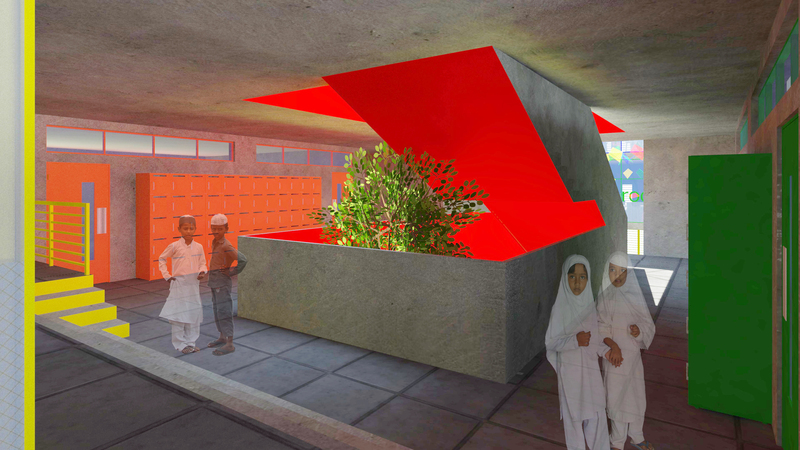 Opportunities for ventilation were created in the form of light wells that run through the height of the structure. 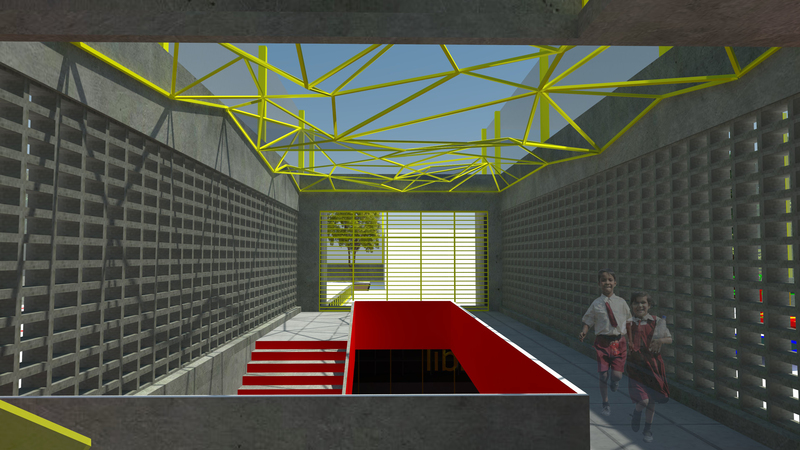 A series of skylights and voids bring in light and air, and expand the space vertically. 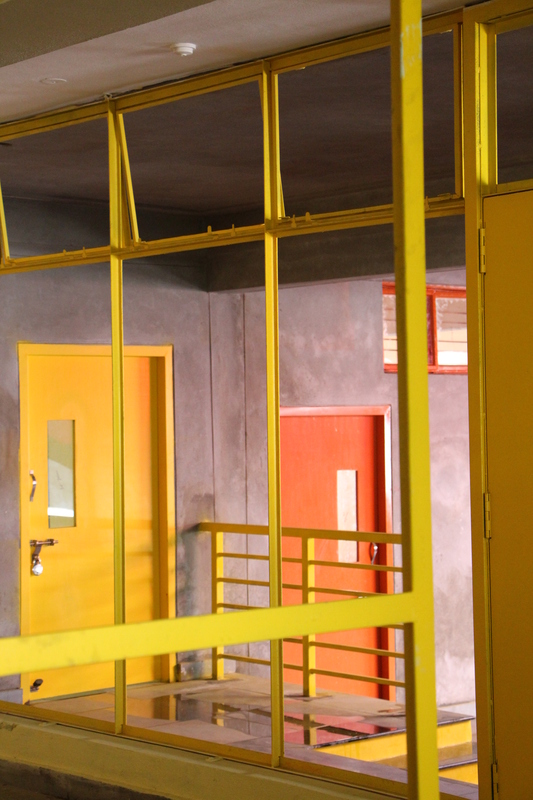 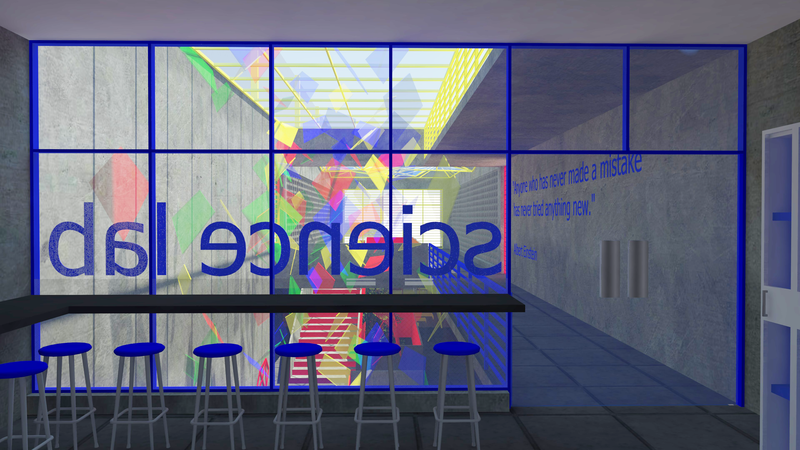 The context is colorful and kitschy, with walls of blue, pink and yellow. 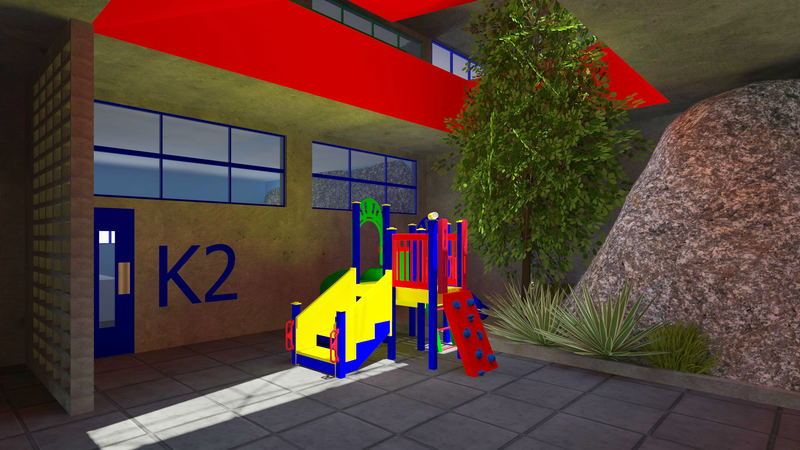 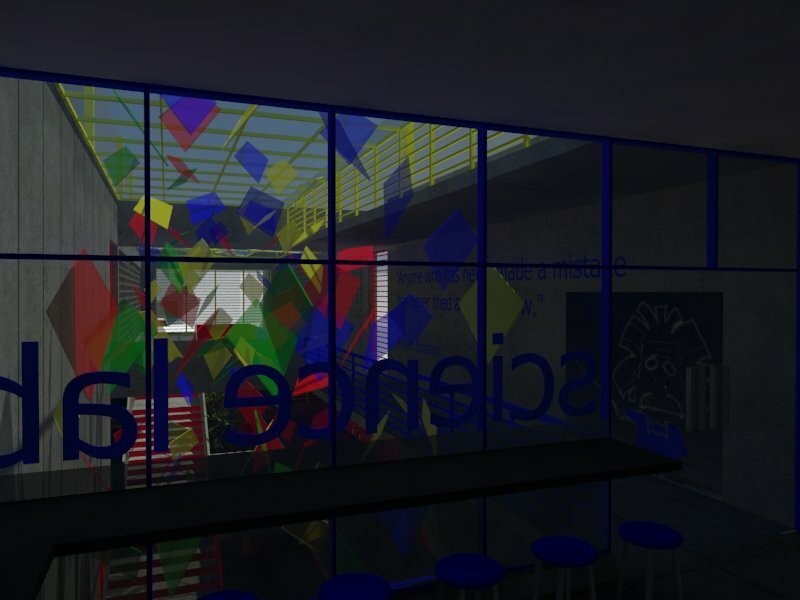 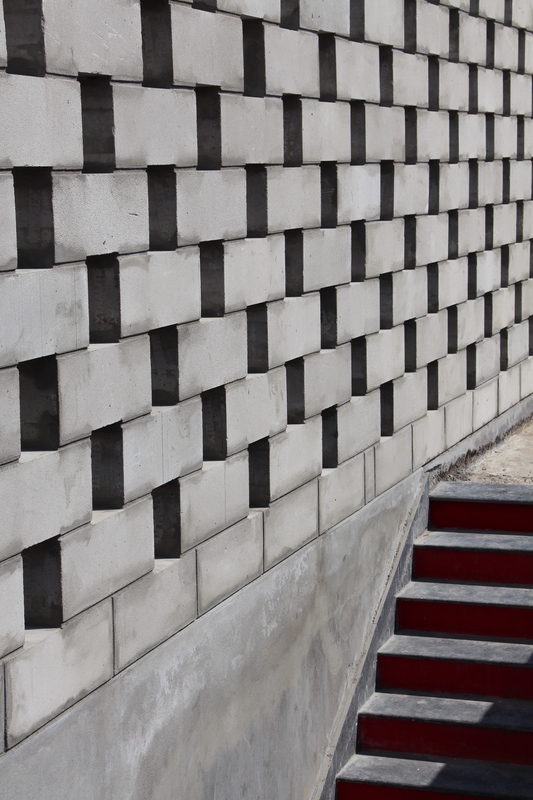 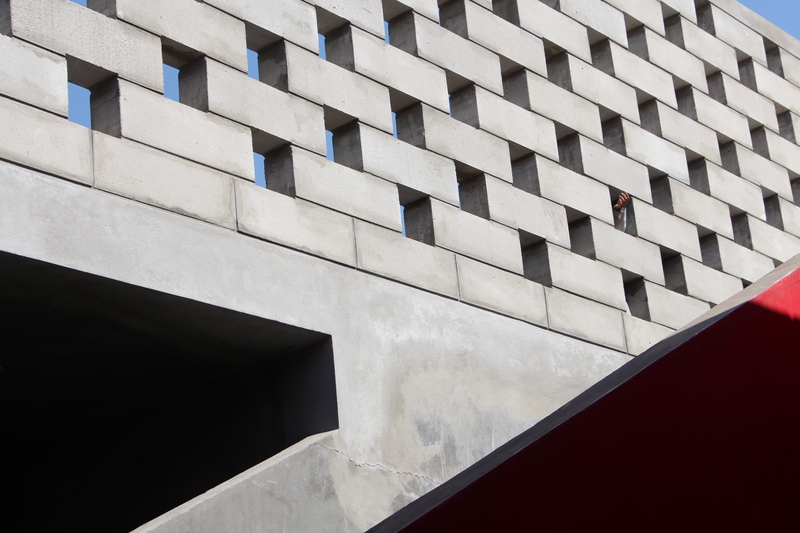 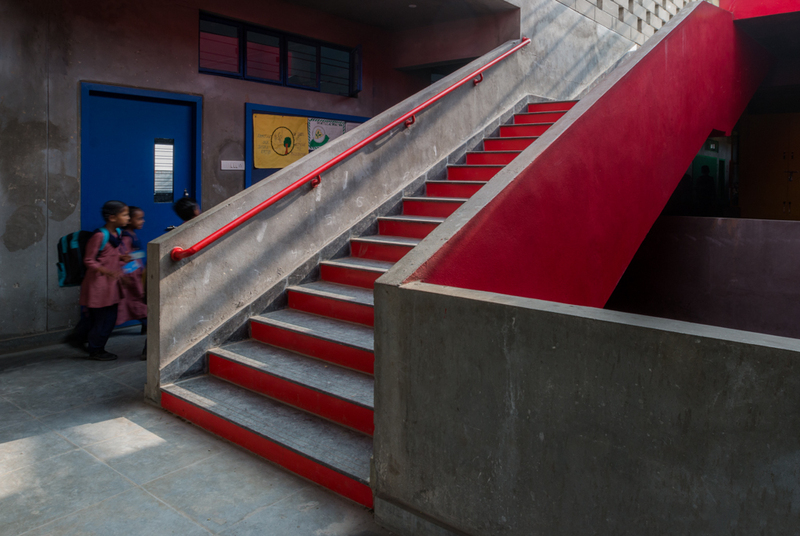 The school respects the scale of the adjoining courtyard houses by creating a small entrance into the kindergarten, also in response to the scale of the younger students. 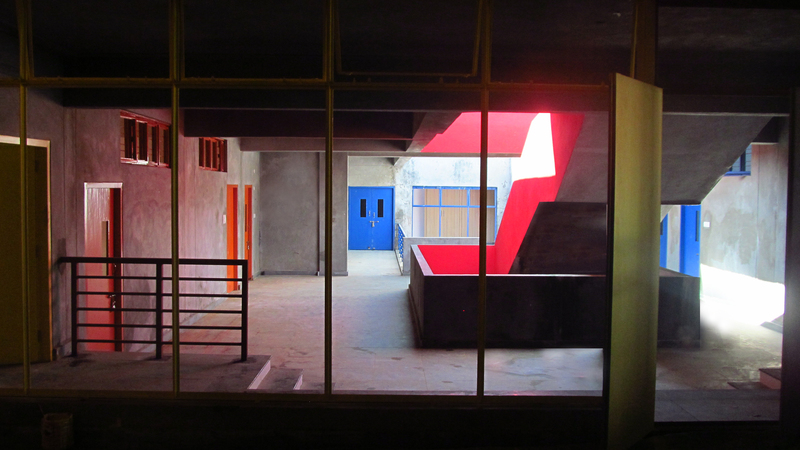 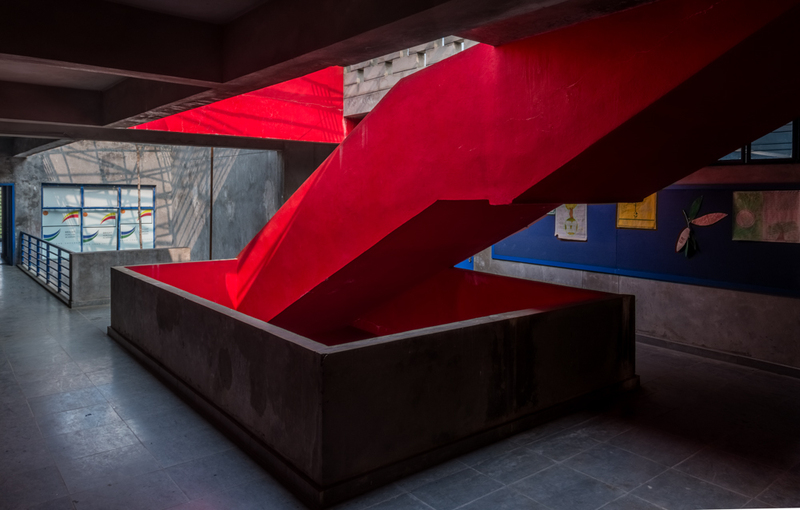 The building is left unfinished in its exterior and common interior spaces, with exposed concrete walls, that deliberately negate color and reduce the need for maintenance in the future. 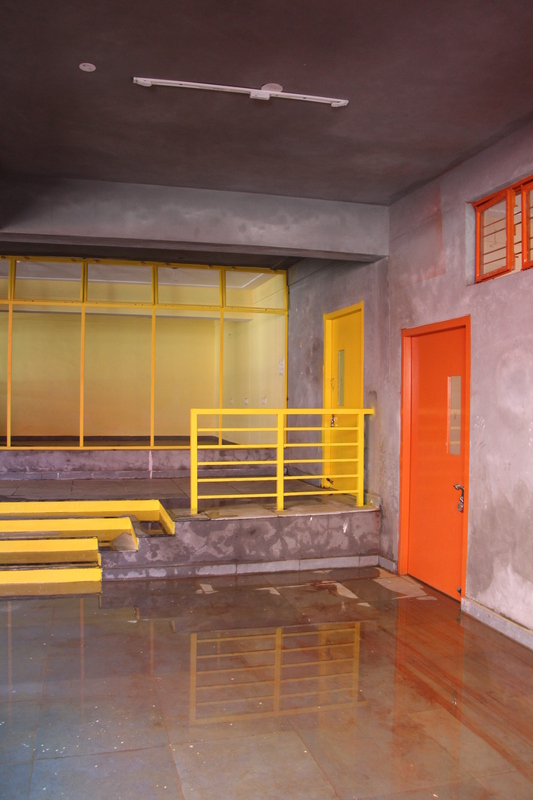 And yet, the color palette of the context is borrowed and reflected in the windows, doors and grilles. 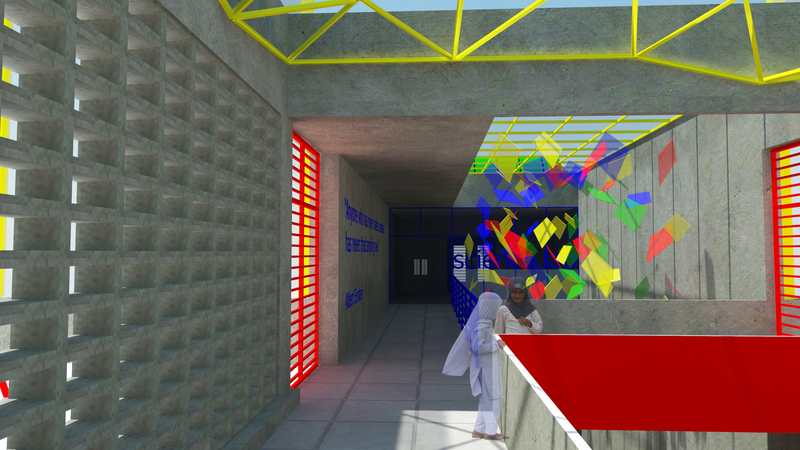 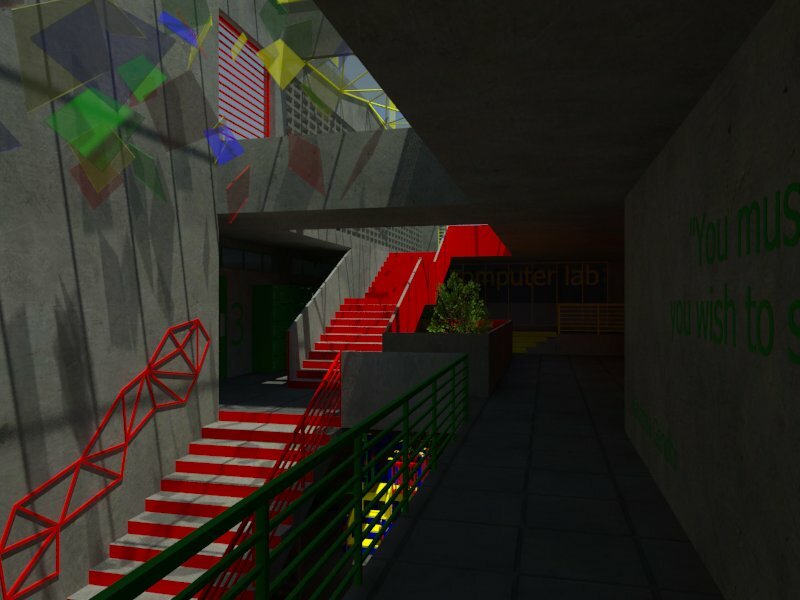 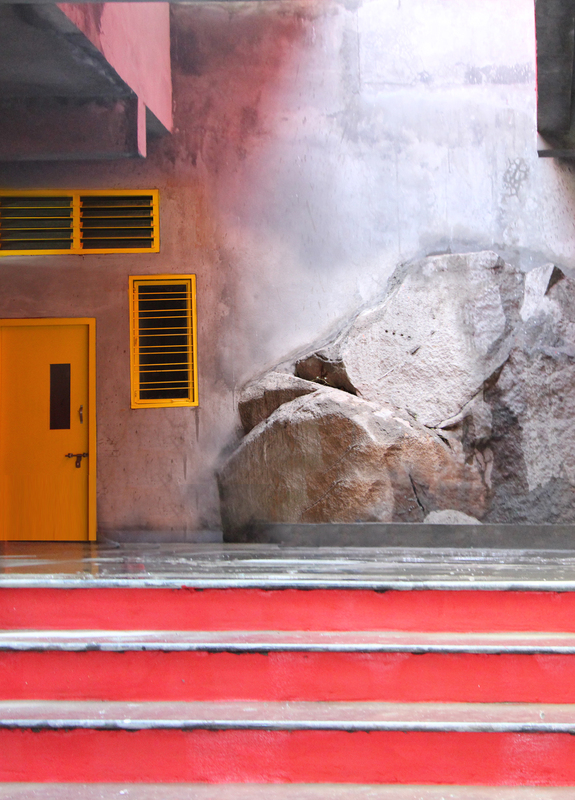 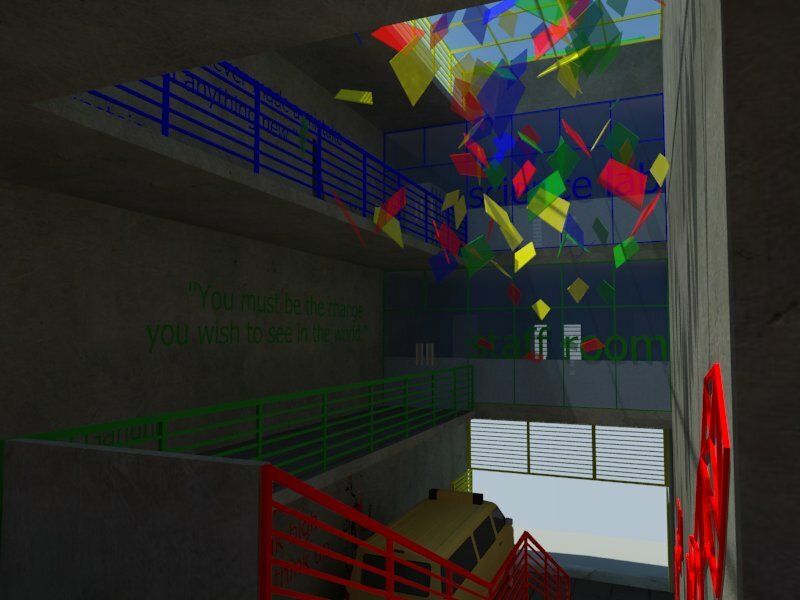 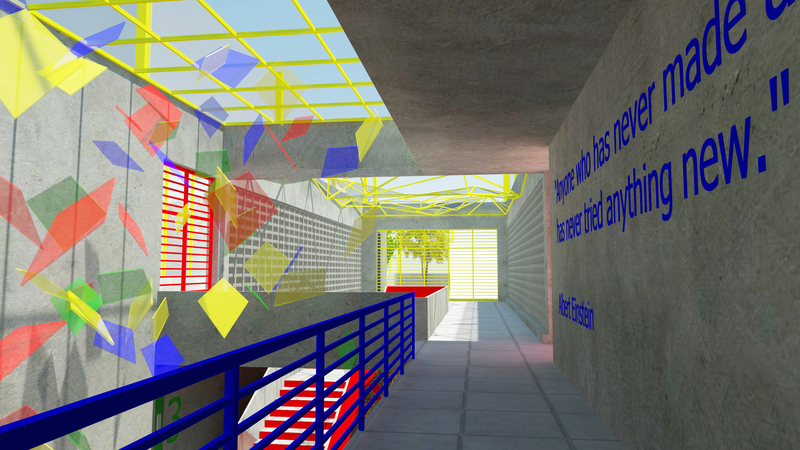 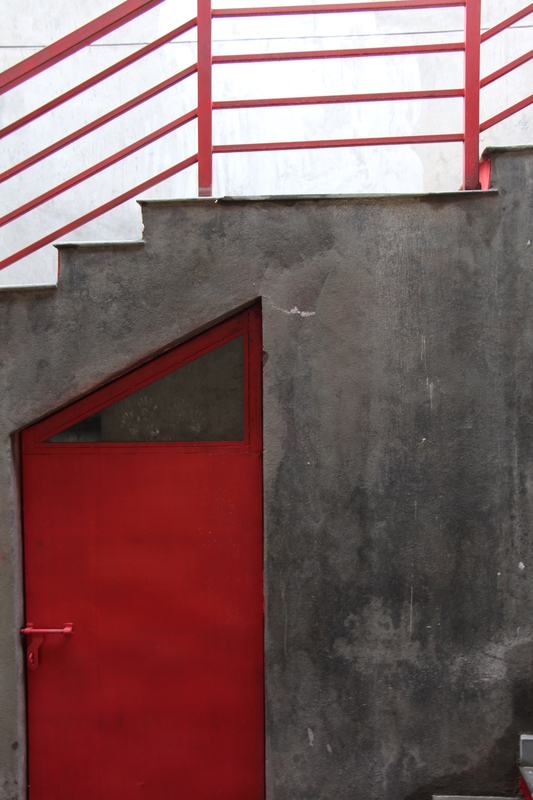 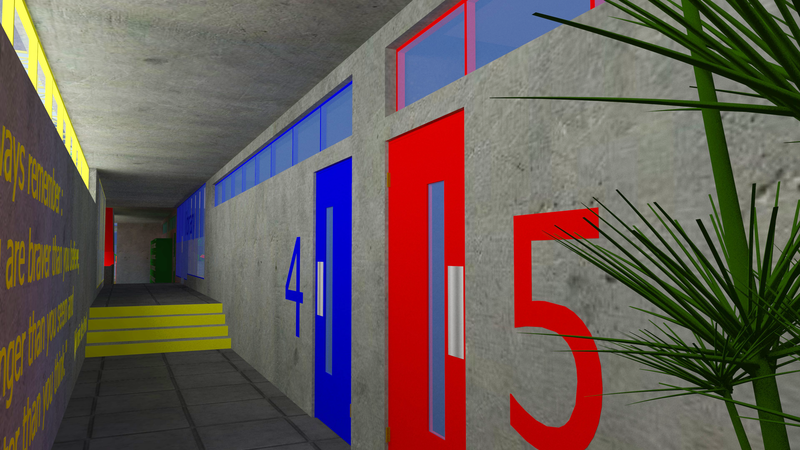 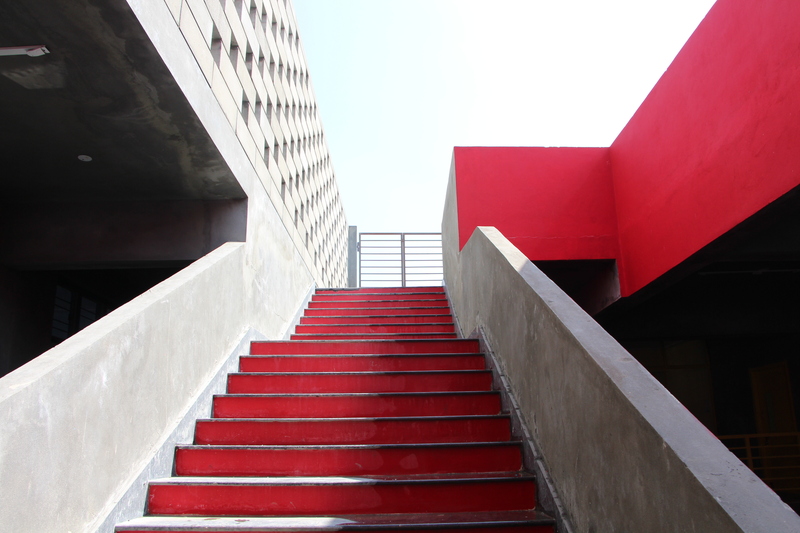 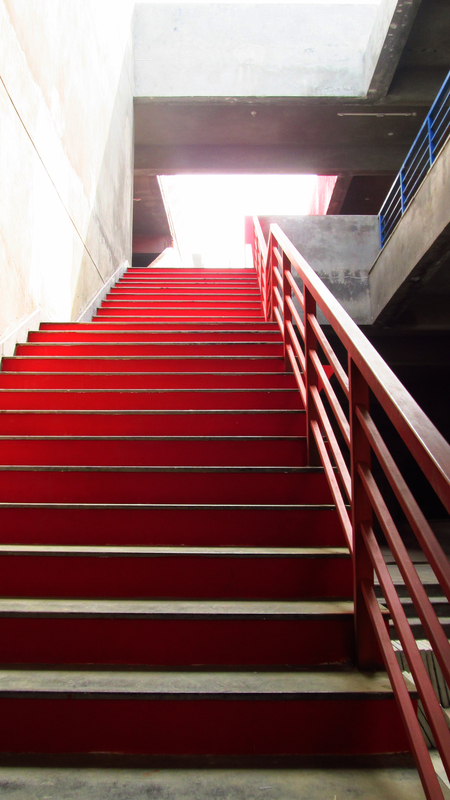 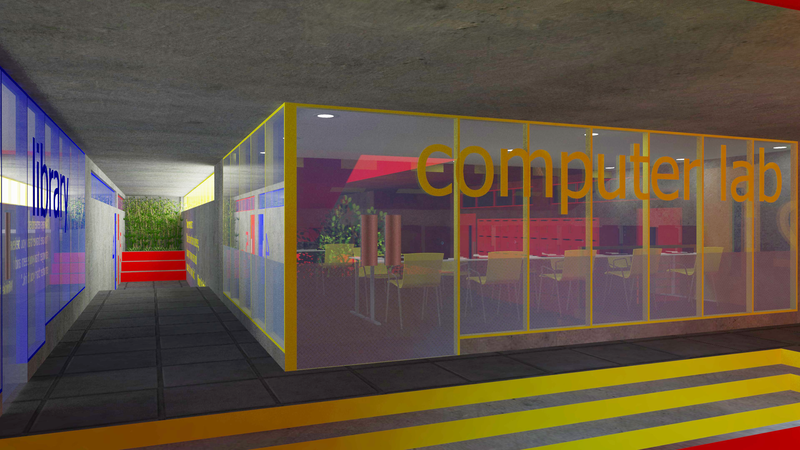 Reds, blues, yellows and greens create pops of color as accents in contrast with the gray of the concrete. 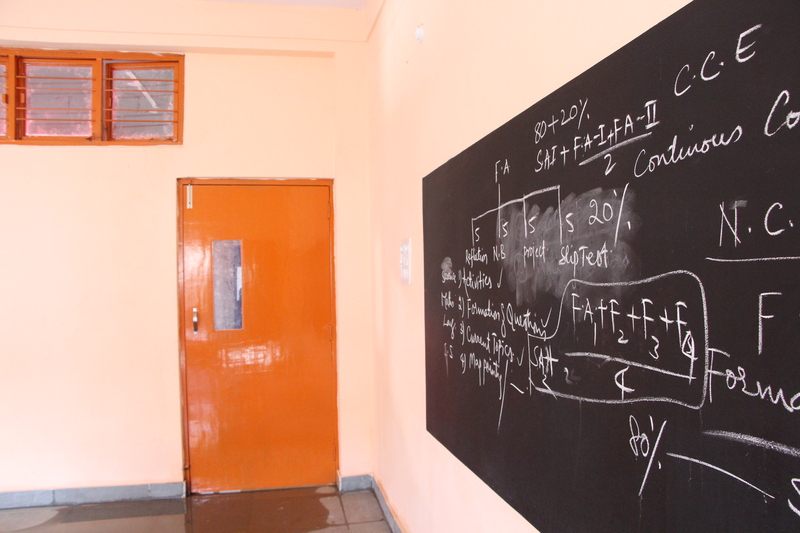 The same colors reappear in subtle pastels in the classroom interiors. 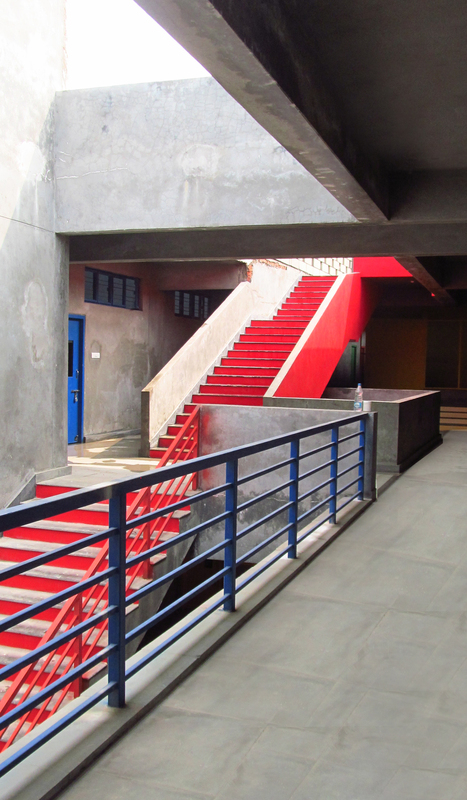 Each of the lowest and highest levels of the school has abutting streets. 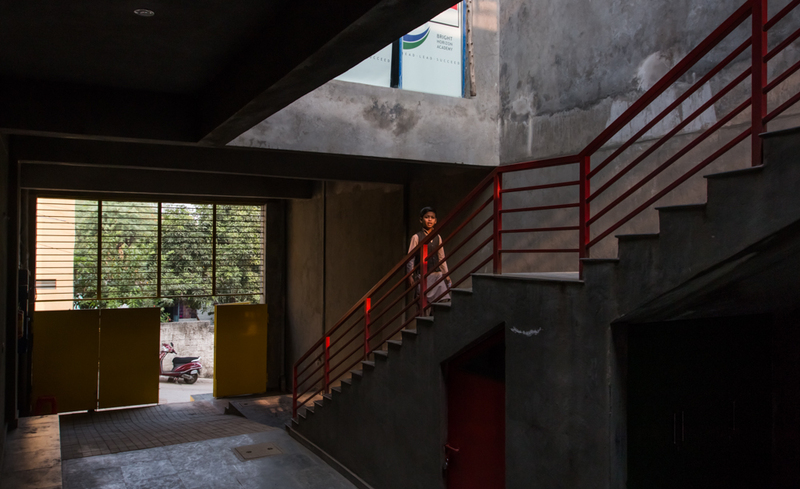 The varying levels allowed reduction in vertical circulation, by providing entrances from the street directly to the ground and first floors. 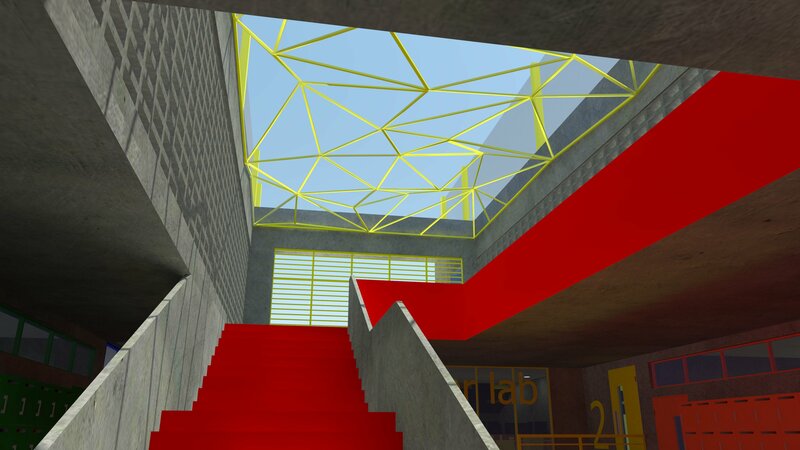 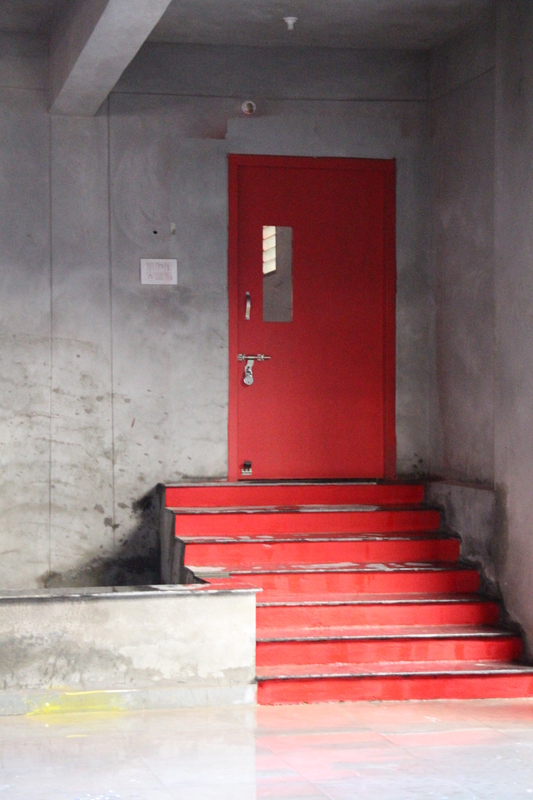 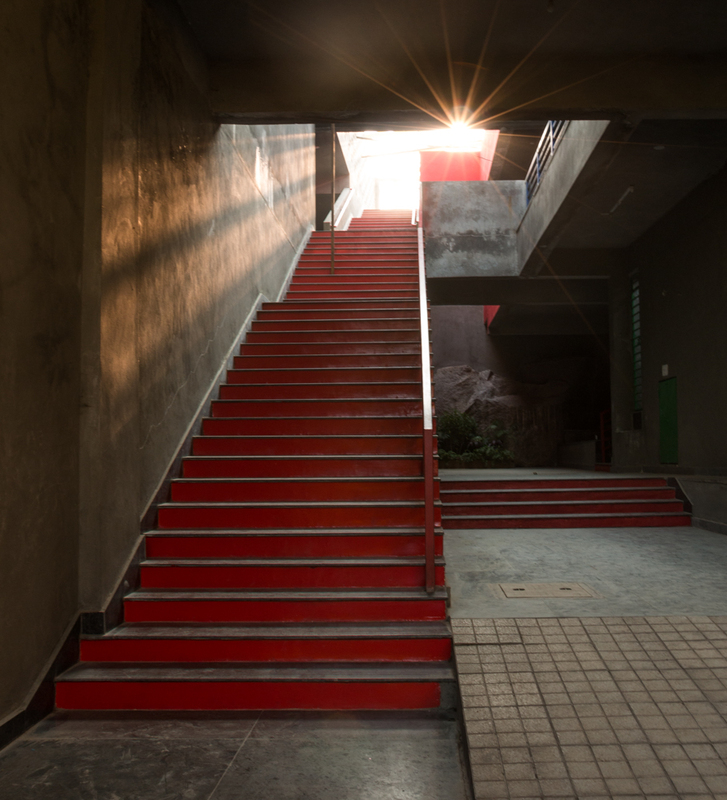 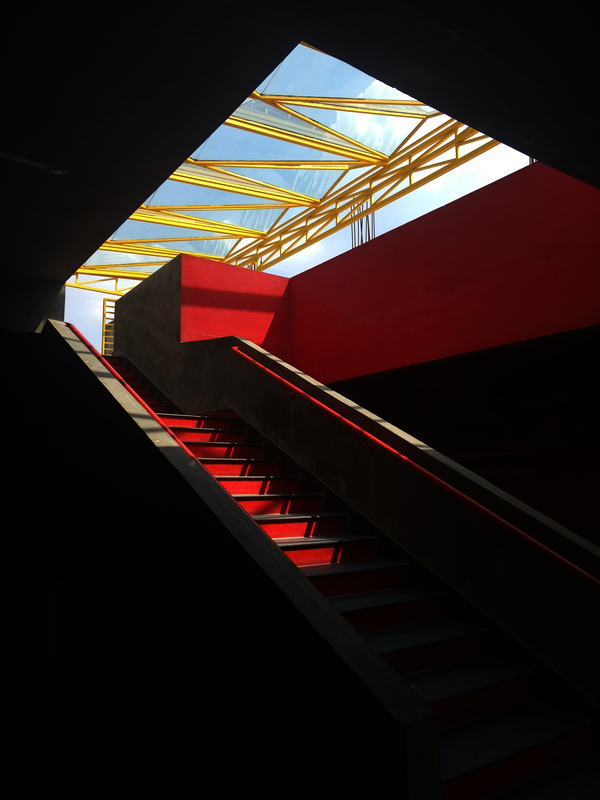 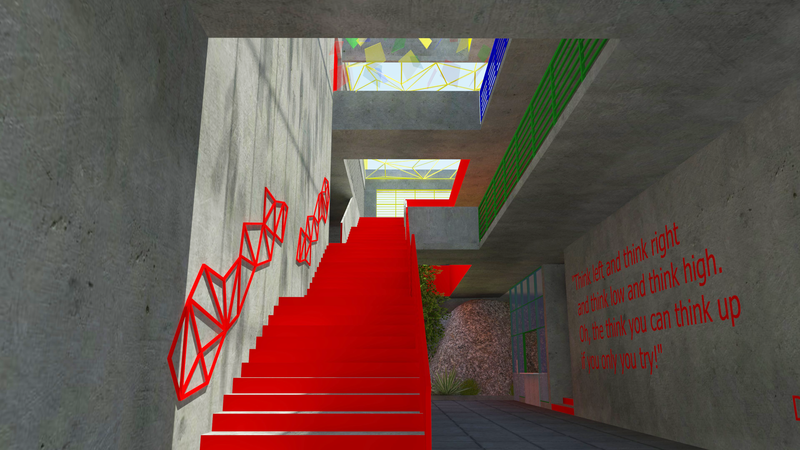 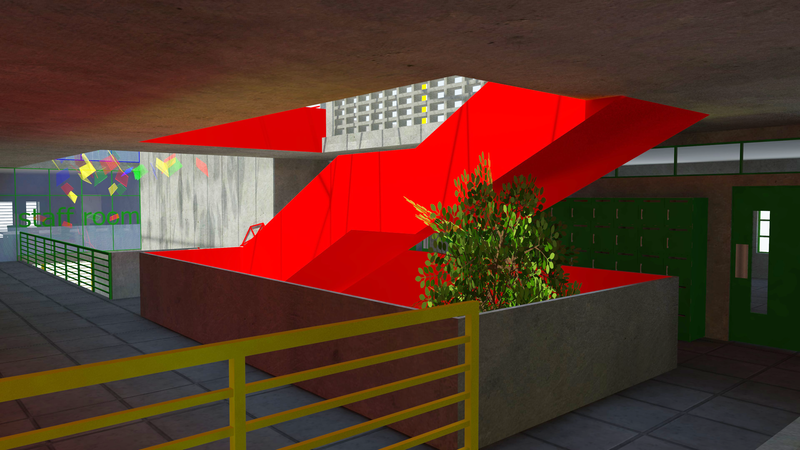 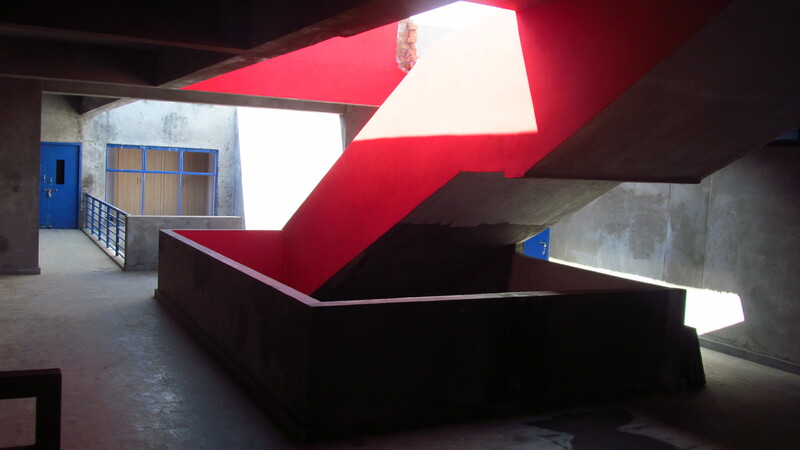 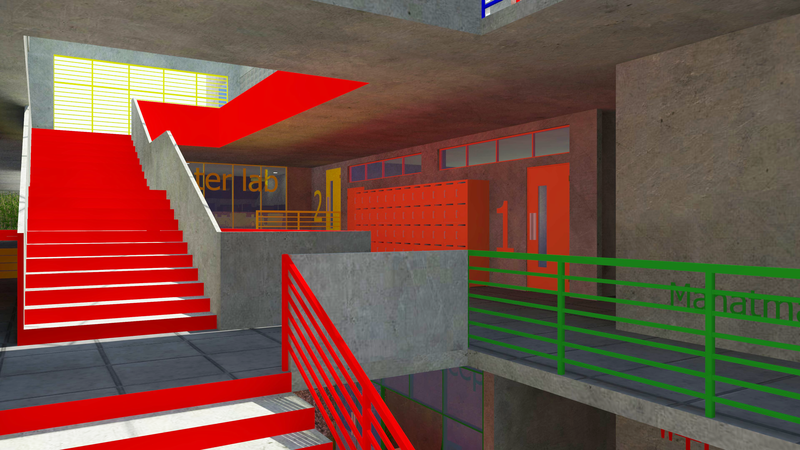 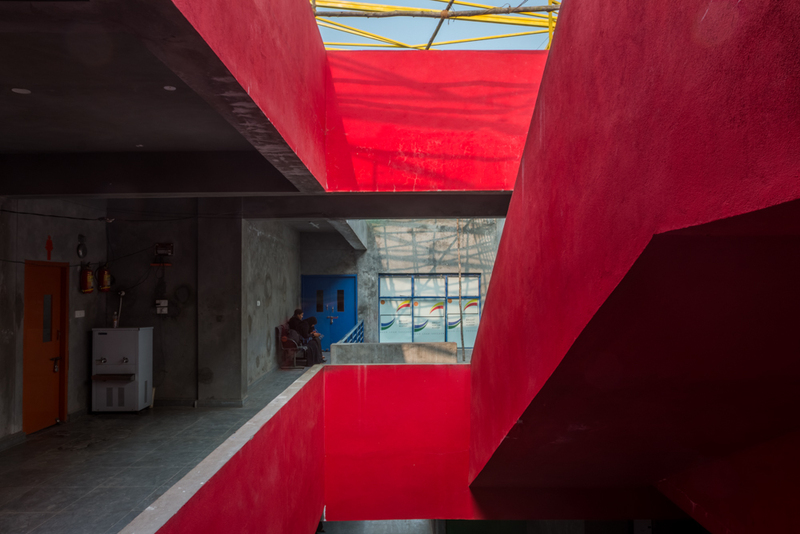 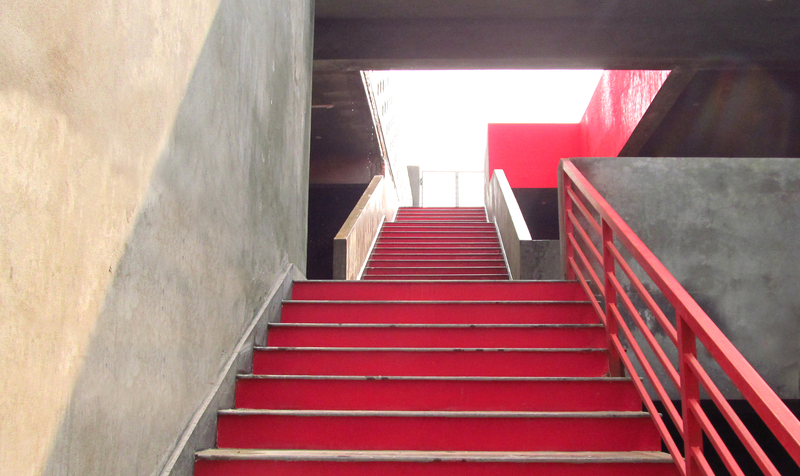 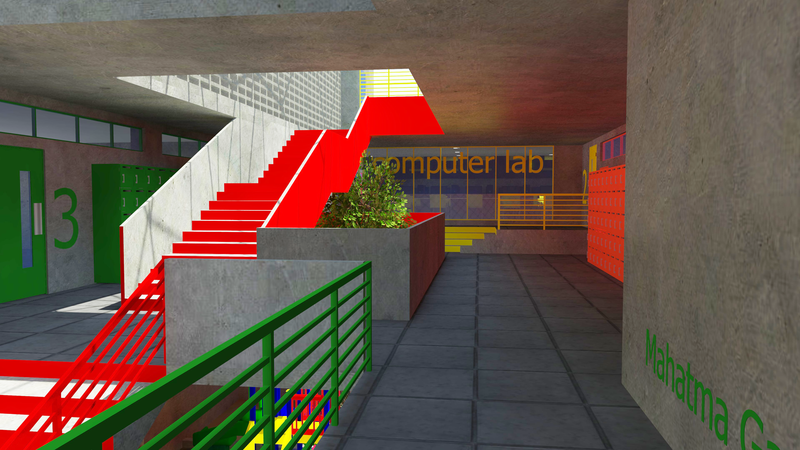 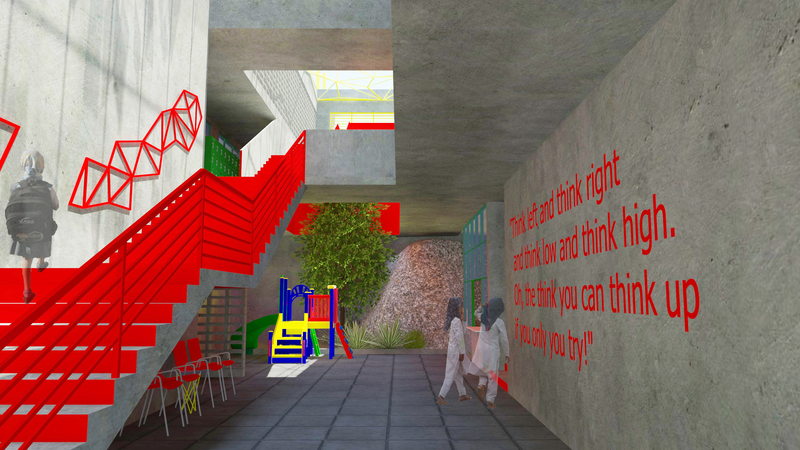 A bright red central staircase cuts through a large atrium, all the way from the ground to the top floor, where the roofs on the school become a playground. 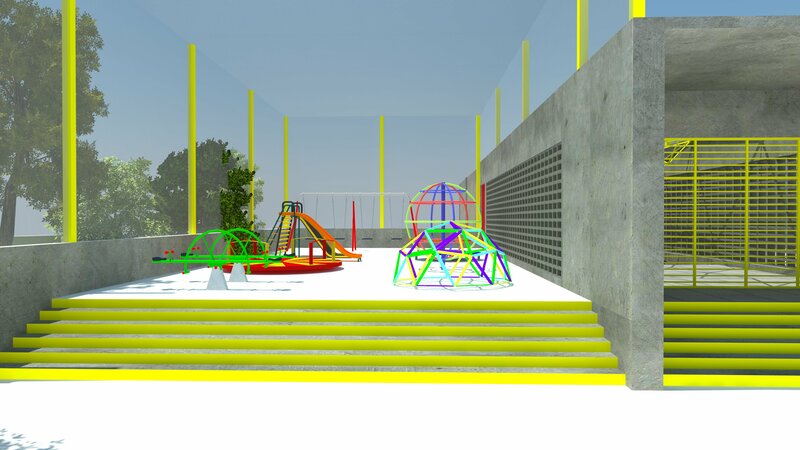 The top level is left bare, enclosed only with permeable hollow block walls and trussed glass roof, and surrounded by different play areas. 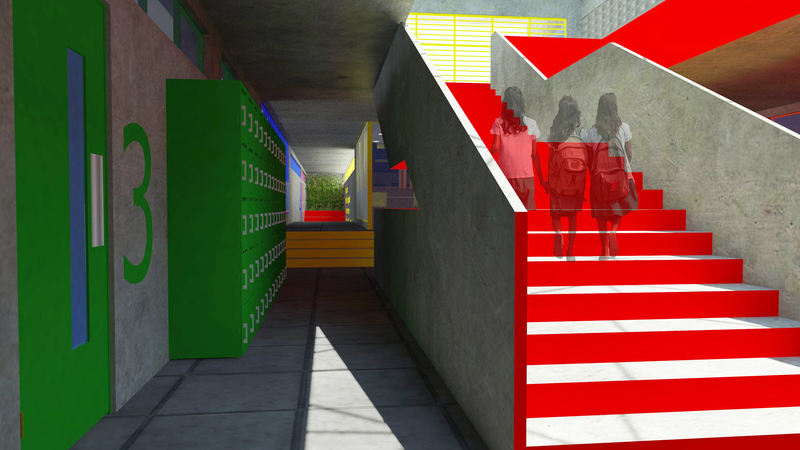 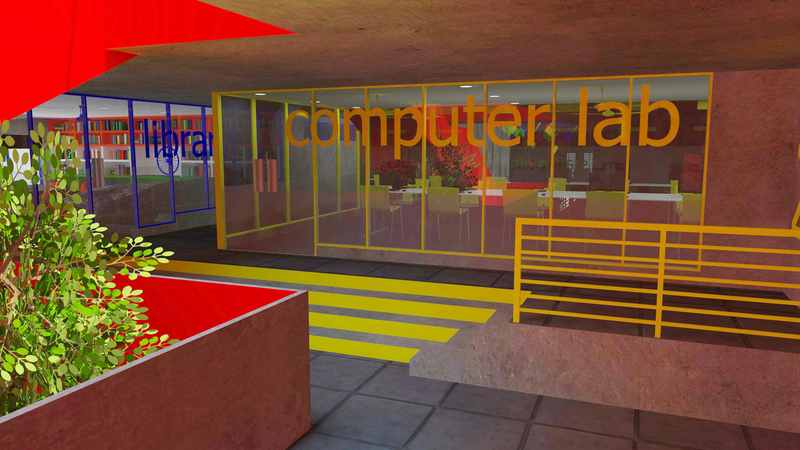 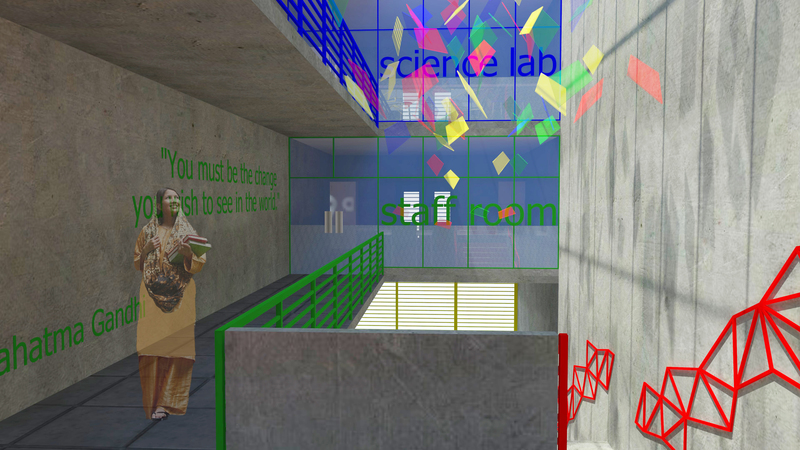 Older students can enter directly from this level, which has a more spacious scale. 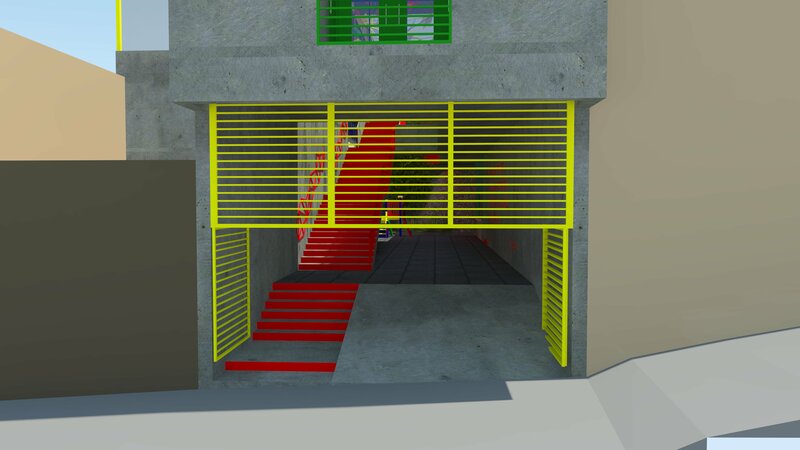 This bifurcation of entrances also allows division of the traffic entering the school, as well as segregation of students by age-group. 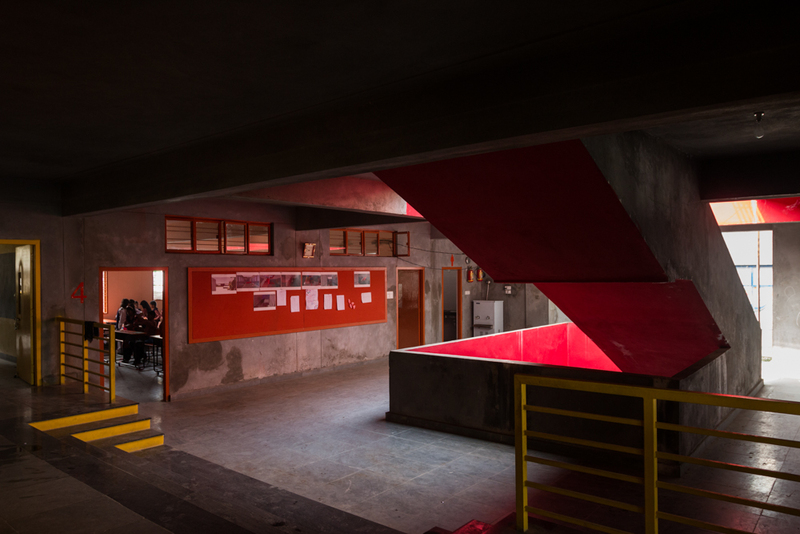 A series of bridges lead from the wider section of the school to the narrow far end overlooking the road, a quite zone where staff rooms and labs are located. 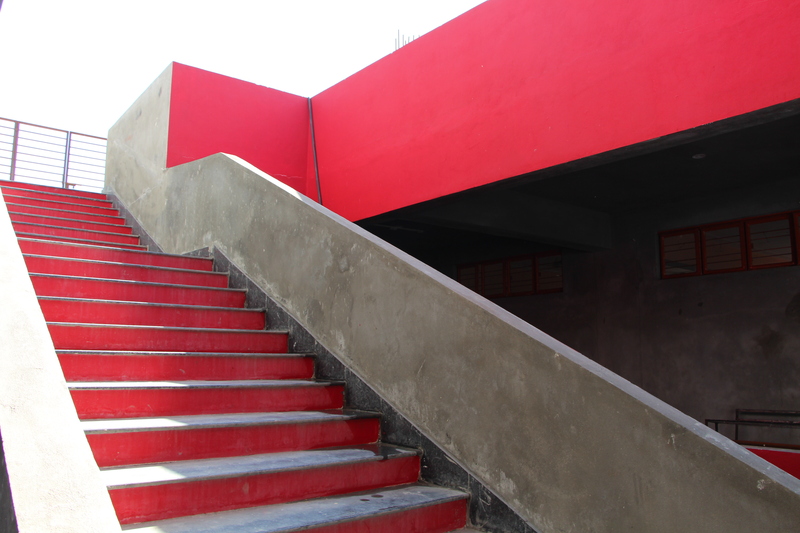 The entire project was conceived, designed and constructed over three years. 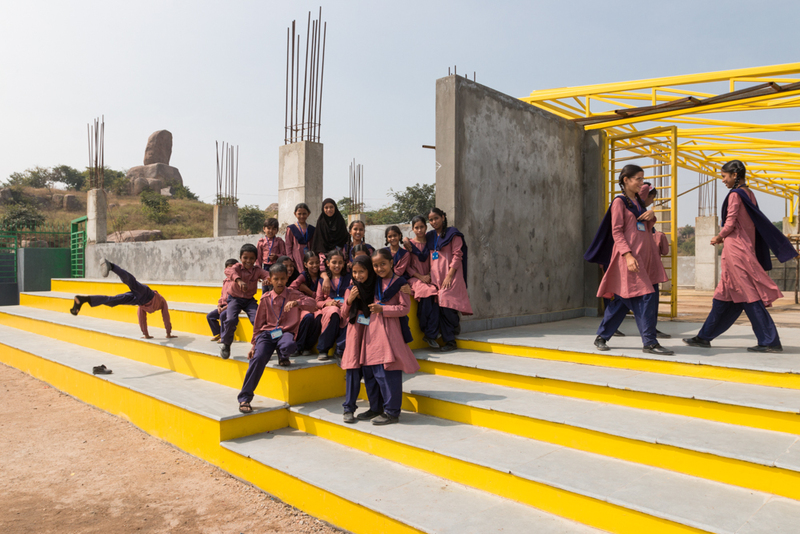 The school was awarded a Silver rating by the Indian Green Building Council at the Green Building Congress 2018.